He’s dedicated his life to two very different professions, and at age 77, Charles Denaburg has no plans to give either of them up. He’s not even really planning on slowing down. Denaburg has been an attorney for some 60 years, and to mark the milestone, the Birmingham Bar Association recently honored him with a lifetime achievement award. This year also marks the 90th anniversary of Levy’s Fine Jewelry, the Denaburg family business where Denaburg started working on Saturdays at age 12. He’s been working there ever since, he said. Between mediations and meetings with clients, Denaburg still makes daily visits to the downtown jewelry store, which he co-owns with sister Rhoda. Levy’s Second Avenue North location is just blocks from his law practice, Najjar Denaburg, P.C., on Morris Avenue. While the two professions are very different, Denaburg admits, the combination has worked well for him over the years. Through the years, Denaburg has practiced just about all types of law, but he now specializes mainly in bankruptcy and commercial law. While transitioning to law school after working weekends in his father’s jewelry store may seem like a stretch, it made sense to Denaburg. He said he had no great aspirations as a young boy to be an attorney, but in high school he took an aptitude test to help him determine a career path. The results indicated he should consider three professions in this order: engineering, architecture or law. “I told my father the results, and he said, ‘You’re going to law school,’” Denaburg said. After graduating from the University of Alabama, he went on to attend and graduate from law school there in 1956. Following law school, he served in the U.S. Air Force as a JAG officer. While in the Air Force, he got to travel and learned that law was the right career path for him. After spending a couple years in Germany with the Air Force, he returned to his hometown of Birmingham to practice law. He began his practice with George Traywick and Red Stewart and then practiced with Silberman and Silberman before opening his own office in 1961. In 1962 he was sharing offices with attorney Tom Najjar. Denaburg and Najjar merged in 1984, and the two men worked together until Najjar’s death in the late 1990s. Denaburg is still practicing at Denaburg Najjar. The firm has about a dozen attorneys. He said a lot has changed since he first began practicing. There were fewer lawyers, forming a close-knit group that was quick to refer cases or lend a hand to a fellow attorney, Denaburg said. The jewelry business has changed quite a bit, too, in many respects, but Denaburg’s father’s philosophy keeps Levy’s strong amongst all the competition. While Denaburg said retirement is out of the question anytime soon, he does enjoying spending time with his family – his wife Jan, six children and 12 grandchildren – and visiting his farm in Dunnavant. Who says nothing good happens after midnight? Not Myra Harper. It was actually just after midnight some 15 years ago that Myra, better known as Miss Myra from her Cahaba Heights barbecue joint, did something that would change her life as well as the lives of countless blind veterans from all over the country. After a night of dancing at a local VFW, she decided to give a few fellows a ride home when nobody else would. The men were blind veterans; the cab that was supposed to take them back to the rehabilitation center for blind veterans in downtown Birmingham never came. “I used to dance all the time,” the 76-year-old said. “That night, the band director said there were some blind veterans there, and of course they couldn’t see to ask us to dance, so he asked us to ask them, and of course we did. Myra gave the veterans a lift back to the rehab center. Still fuming that no one offered them help, Myra told the men to give her a call anytime they needed anything and to pass the offer on to others at the center. Her two new friends did call, and they did pass the information on to fellow blind veterans. That was 1996. While Myra might not be dancing as often, she is still helping blind veterans, whether it’s giving them a ride to the store or hosting an annual reunion for the many who have passed through the Department of Veterans Affairs Blind Rehabilitation Center. Veterans at the center go through a three- to 12-week program that helps them adjust to blindness. They come from all over the country and are all ages. 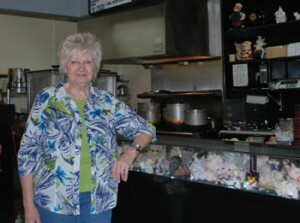 While Myra has volunteered her time to helping these veterans, they aren’t the only ones benefiting from her service. Myra’s first husband, Clark Rountree, died in 1996. She did, though. Four years ago, she married Karl Harper, a blind veteran she met at the center. Thanks to the center, Karl is still able to enjoy his woodworking hobby, though illness has recently slowed him some. It’s also caused Myra to quit working at her family restaurant and to cut back on some of her work at the center — but not completely. She’s now working on the rehab center reunion, coming up in June. This year, she’s in charge of gathering items for the auction. Since her husband is recovering, she said, she hopes to get back to dancing occasionally and also to taking the veterans at the rehab center to dinner once a week. The way Myra sees it, she was meant to meet those two blind vets after midnight that day some 15 years ago — not just for their sake but also for hers. For more information about the blind veterans’ reunion or to donate auction items, contact Myra at 967-5788. When Paul Woods’ doctor ordered him to join a gym, the retired firefighter thought the most he might get from it was dropping a few pounds. Well, he got that – to date he’s lost 60 pounds – and much, much more. 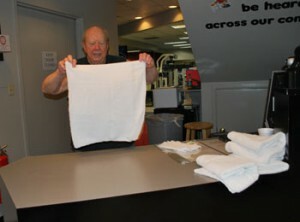 Paul, 78, has been a regular at the Vestavia Express YMCA since joining in 2006. At first, the Bluff Park resident was just taking a few classes a week and maybe doing some walking. It was the socializing that kept Paul coming back. Now, he’s there at least three days a week, sometimes for several hours. He typically arrives around 7 a.m. and often doesn’t leave until mid-afternoon. A bad back has kept Paul from attending some classes, but it hasn’t stopped him from mixing and mingling and helping out where he can. After a workout in the pool and maybe a little walking, Paul then begins his volunteer work at the branch. Though the former Birmingham Fire Department lieutenant will say it’s not much, his work at the Y recently earned him the branch’s Volunteer of the Year award. To Paul, helping out around the gym is almost second nature. After all, he was a firefighter for some 30 years. He also folds towels and works the front desk, greeting gym-goers with a friendly hello, or maybe even a “hey babe” or “babe-o,” even though he knows most members by name. Paul joined the Y at just the right time. Having worked for the fire department and also at a part-time job most of his adult life, he was used to being busy. Then in 2003, Polly, his wife of some 50 years, passed away. Paul needed to get out and get active again, so his doctor suggested he join a gym not only for health benefits but to meet new people. In 2004, he joined the Hoover Rec Center. While it met his needs when it came to exercise, it was lacking in the social department for him. The smaller, more intimate setting of the Vestavia Y seemed to be a better fit for Paul. He quickly bonded with the staff and other regulars. There’s also a lot more to it than just a jog around the track or a fitness class. Members converse over coffee and sometimes enjoy breakfast together. There’s also the occasional birthday celebration. To Paul, volunteering at the gym is his social time, and it hasn’t hurt his health, either.